Lightly spray waffle iron with cooking spray; heat waffle iron. In large bowl, stir together flours, oats, baking powder and sugar. In small bowl, stir together milk, oil and egg. Stir into dry ingredients in large bowl, stirring just until large lumps disappear. Gently stir in blueberries. 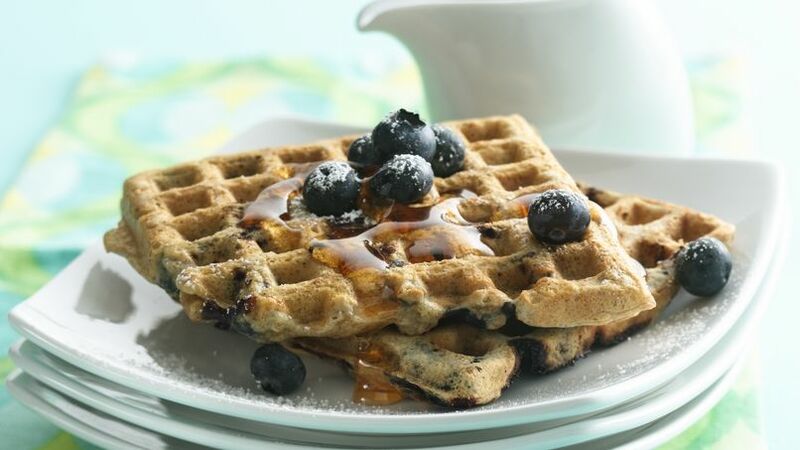 Pour slightly less than 1 cup batter onto center of hot waffle iron, spreading batter to edges. (Check manufacturer's directions for recommended amount of batter.) Close lid of waffle iron. Bake 3 to 5 minutes or until waffle is golden brown. Carefully remove waffle. Serve immediately. Repeat with remaining batter. Oats are loaded with fiber--the soluble kind that helps to lower blood cholesterol. Start slowly so you have time to get used to more fiber!